15-2150MHz Wideband Satellite TV Signal Splitter with Power passing on All Ports. Grounding Block Attached, series uses Solder Back Case for 130 dB RF shielding. This Splitter can be installed in confined spaces such as Lock-Boxes because the Output RG-6 Cable Connection F Ports all leave in the same direction. Hollands high performance passives are designed for distribution of digital satellite signals in applications where signal integrity is critical. The HRS Series splitters utilize diode protected circuitry to prevent DC backfeeding. 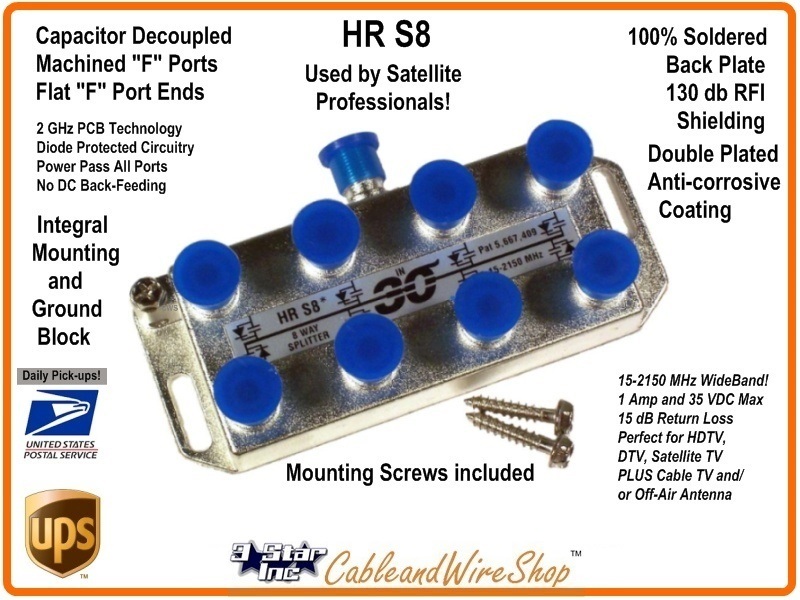 These 8-Way Satellite Splitters are typically the Part you would use to take One (1) LNB(F) Feed and "Split" it into Eight (8) in order to present Signal to 8 Independant Receivers. Please be Sure to Select the Appropriate Device not just By Manufacturer and Price. But Rather, Consider the Specifics of Bandwidth, Packaging (Indoor vs. Outdoor), Insertion Loss, Powering Requirements Up/Down-Stream and the Overall Needs of the Final System You Wish to Create.